We believe in the “Do-It-Yourself” ethos as key to being a self-reliant artist. We encourage members of Light Work Lab to use the space in a Do-It-Yourself (DIY) manner. After a short orientation and equipment training, we offer members access to high-end printmaking at extremely low rates. The advantage of this methodology is artists learn a valuable skill set as well as get extremely affordable costs. Everything at Light Work begins with membership. 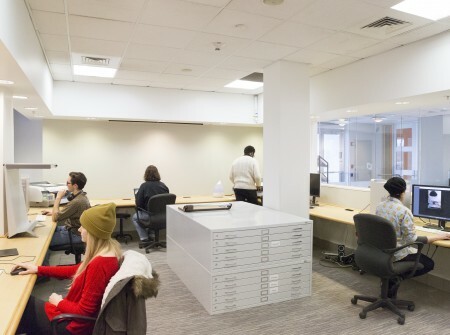 Once you have joined our community as a member, you have access to our state-of-the-art lab including computers running Adobe CC, Epson inkjet printers, scanners, a lighting studio, and a darkroom. With an active membership, you can reserve equipment for no extra cost by visiting our reservations page. (Height x Width) x (Sq. in. price) = Cost of print. For a detailed tutorial on how to inkjet print click here! For a detailed tutorial on how to Imacon scan and invert click here! The Light Work digital lab is set up in an intuitive workstation format with Mac computers, color-managed monitors, print viewing stations, professional grade scanners, and easy to use DIY printers. We have a wide array of scanners available for members to use. All scanners except for the drum scanner are free to use. We recommend making a reservation prior to your planned visit in order to guarantee use of the equipment. Drum scans are $11 a load. The number of scans you can fit per load depends on your film format. You can fit >15 35mm, but only 1 8×10 per load. To DIY on this scanner, a training session is required.